The Prologue may have wooden end-cheeks, but it’s a very different beast to the polysynths of yore. Analogue classics such as the Prophet 5, the Memorymoog, the Chroma, the Jupiter 8 and the Matrix 12, while weighty beasts, were all considerably narrower than the 88-note monsters that we take for granted in the digital age. Nevertheless, when Korg sent me the first of their “new generation of flagship analogue synthesizers”, I didn’t expect it to be a cheeky little 49-key, eight-voice synth that I could pick up with one finger. The company later swapped this for the top-of-the-range 61-key, 16-voice model, but this was still not what I would call heavy, imposing or, in some undefined way, flagship-y. So I wondered, is someone playing fast and loose with the English language, or is there something special hiding inside the diminutive cases of the company’s new babies? Despite their wooden end cheeks, both Prologues look and feel modern, although with a nod in the direction of some early polysynths. Their gently curved control panels could just as easily hide virtual-analogue synth engines, but the Prologues are far from that, with each of their voices boasting two analogue oscillators, an analogue filter and an analogue audio amplifier, together with an analogue compressor at the end of the signal chain on the larger model. Nonetheless, there’s a hefty amount of computation going on inside too, with a third, digital oscillator per voice, digital LFOs, digital contour generators and digital effects. Many of their controls are implemented digitally, too; so if, for example, you press their octave shift buttons, you hear no changes until you play the next note. Consequently, despite being described as flagship analogue synthesizers, the Prologues (which, from now on, I’m going to refer to as simple ‘the Prologue’) are analogue/digital hybrids — not that there’s anything wrong with that. Despite digital tuning and those digital control systems, the Prologue’s analogue oscillators are true VCOs that are kept at arm’s length from the microcontrollers running in the background. They offer three waveforms — sawtooth, triangle and square — and can be switched between four octaves, from 16’ to 2’. Shape knobs then let you distort their waveshapes, and pitch knobs allow you to fine-tune them by ±1 octave in steps of one cent. When modulated by the LFO, waveshaping can generate a basic Supersaw effect, something akin to Arturia’s Metalizer effect (albeit with lower modulation depth), or traditional PWM. Happily, you can waveshape one analogue oscillator and not the other, which allows you to create patches that, for example, combine a sawtooth wave and a PWM wave, which is necessary for some classic analogue sounds. Other facilities include sync and cross modulation of VCO 2 using VCO 1, as well as ring modulation provided by a genuine ring that allows you to use all of the available waveforms as sources. Cyclic pitch modulation can be supplied by the LFO, while sweeps are generated using the global ADSR contour generator. Both of these can be directed at VCO 2 alone, VCO 1 and VCO 2, or VCO 1 and VCO 2 and the third oscillator per voice, which is called the Multi Engine. This is a digital oscillator that, instead of offering three waveforms, offers three modes of sound generation. The first is Noise, which generates four types of noise that can be further refined using the oscillator’s Shape control. Happily, the peak (band-pass) type is sufficiently tonal to be used to create breathy sounds that you can play chromatically. The second mode is VPM which, as always, is Korg’s implementation of FM synthesis — in this case two-operator FM. There are no fewer than 16 algorithms available utilising various carriers, modulators and feedback settings, and you can alter the modulator depth and the modulator pitch ratio using the Shape knob and Shift-Shape respectively. There are also six VPM parameters in the menus, and these include controls for keyboard tracking and a simple AD modulation depth contour. I fear that some people will view two-operator FM as a bit pointless but, as an owner of a Yamaha GS-2, I can assure you that this isn’t so. If you’re prepared to spend a bit of time with it, you’ll discover that you can conjure a surprising range of sounds this way. The third mode is called USR and contains 16 slots into which developers will be able to load oscillator programs developed using the Prologue SDK (see box). As shipped from the factory, one of these slots contains an oscillator called Waves: this comprises a low-amplitude sub-oscillator together with a primary wave that sweeps from a sine wave at one extreme of the Shape control to a typical ‘digital’ wave with a subdued fundamental at the other. Tucked away in the Program menus, you’ll find a parameter that allows you to determine whether the output from the Multi Engine passes through the mixer and filter section, or bypasses them to arrive directly at the VCA and effects sections. This allows you to do things such as mix an unmolested FM sound with an analogue sound sculpted by the Prologue’s filters. Korg haven’t made a big fuss about this, but it offers some intriguing possibilities. It took me less than five minutes to create a patch that mixed a simple FM piano with swelled analogue strings, and the result showed great promise. I suspect that there’s a lot here to be discovered. If the output from the Multi Engine is to be passed through the filters, it’s converted to an analogue signal and then mixed with the outputs from VCO 1 and VCO 2 (or VCO 1 and the output from the ring modulator) and the combined signal is then presented to the VCF section. This comprises two filters: a gentle high-pass filter controlled merely by an on/off switch, and a resonant 12dB/octave low-pass device offering the expected cutoff, resonance and bipolar contour amount controls, with additional switches for overdrive and keyboard tracking. I must admit that I question the choice of switches instead of knobs for these functions, because the latter would have allowed for far greater control over the sound. Despite some superficial similarities, this filter isn’t the same as that used in either the Minilogue or the more recent Monologue. I discussed this with the people at Korg, and they stated that, after considering the raw waveforms that are already available in the Prologue (and speculating about those that could become available when new oscillators are implemented by developers), they had decided that a different design was needed. Unfortunately, this has no 24dB/octave option, which seems surprising. When I queried this, they said that the new filter couldn’t be implemented in a 24dB form, but I must admit that I don’t find this answer convincing; you can place two identical 12dB filters in series to create a 24dB/octave filter. Maybe there’s something going on here that we don’t know about, or maybe they simply decided that the filter sounds great as it is, in which case they should have said so. The Prologue’s low-pass filters (one per voice) will oscillate when the resonance is high enough. Since they tune to almost the same pitch and the keyboard tracking is accurate enough, you can then play them chromatically to create some slightly wonky, out-of-tune sounds that can be quite interesting. Furthermore, the filters will lock to the oscillators, which means that you can create sounds using up to four sources — VCO 1, VCO 2, the Multi Engine, and the oscillating filter — should you wish. (Strangely, the Prologue 8 that I had here was not able to track as accurately or lock well enough to do this but, since it may have been a production prototype, I’m not going to hold that against it.) It was while experimenting with playing the filter that I discovered that the quantisation of its cutoff frequency knob seems to be about a quarter tone, which is coarser than I had expected. But I can’t say that I encountered any objectionable zipper noise when sweeping it, so I have no problems with that. You can modulate the filter cutoff frequency in three ways: using the LFO, using the general ADSR contour generator, and using velocity, the sensitivity of which can be set in a menu. Happily, the velocity affects the amount by which the contour is applied rather than affecting the cutoff frequency directly, which is as it should be. On the other hand, testing revealed that the longest attack time is just three seconds. This is much shorter than I would like, and precludes sounds that swell over a more extended period. Given that the contour is calculated digitally and then converted to a CV, I have no idea why this should be the case, especially since the maximum times for the decay and release phases are considerably longer. After the filter, the signal passes to the audio amplifier, the gain of which is controlled by a second ADSR contour generator that can also be made velocity-sensitive. There’s no LFO modulation, so tremolo is not possible. Before leaving the contours, I noted two additional points during my tests — one good, the other not so good. Starting with the former I found that, unless voice stealing occurs, contours with slow attacks and releases pick up from the current position on successive notes, which ensures that there’s no nasty ‘sucking’ sound. However, like those on some recent Korg synths, the contours’ phases seem to be rather linear, which can result in a cusp as the decay stage transitions into the sustain stage. It’s only audible in a few, specific cases, but it’s not ideal. The Prologue offers just one LFO per voice. This offers three modes: slow, fast and BPM, the last of which synchronises it with the synth’s arpeggiator. The fast range has an upper frequency of 2.8kHz, which suggests all sorts of interesting possibilities, but you can’t make it track the keyboard, which eliminates almost all of them. You adjust the LFO frequency and depth using the dedicated knobs, and you can invert the waveform by using Shift-Intensity, which converts the ramp wave into a sawtooth but, for obvious reasons, is pointless for the triangle and square waves. There are just three destinations: the oscillators’ pitches, various combinations of their waveshapes, and the filter cutoff frequency. Unfortunately, you can direct the LFO to only one of these at a time. Since there are no Sample & Hold or random options, and no niceties such as affecting the LFO rate or intensity using a contour generator, this is perhaps the most limiting aspect of the Prologue’s architecture. If the processing power and memory is available, it wouldn’t have cost anything to add a couple of software-generated LFOs and contour generators, and not a huge amount to add the D-A converters and VCAs necessary for them to control other aspects of the synth. Consequently, this degree of simplicity was almost certainly a decision rather than a limitation forced upon the designers. By default, the LFOs for every voice are locked together and are initialised each time that you press a key, which is equivalent to having a single LFO for the whole synthesizer. You can switch these constraints off in the menus, so I did — first the key sync and then the voice sync — whereupon they remained locked together! Eventually, I found that switching the parameters back on and then off again in a particular order separated the LFOs so that I could program sounds with independent modulation on each note. This is clearly a bug, and I’m confident that it will be fixed before the products are shipped. The second effects section contains delays and reverbs, with 12 distinct delay effects and 10 reverbs including four special effects that I like a lot. Again, there are just two parameters — Time and Depth — but I didn’t find this to be a significant limitation. (If you want complex and tightly defined effects, you’ll probably turn to an external processor anyway.) However, the maximum gain of the feedback loop in the delay is a little under unity, which means that you can’t obtain the sci-fi effects that would otherwise be possible. On at least one recent Korg polysynth, the maximum gain is a little greater than unity, so you have to wonder why the company changed this. The Prologue is a bi-timbral synth, capable of accessing two patches (called Timbres) in a single Program, whether split, layered, or crossfaded from one to the other on either side of the split point. The two Timbres are named Main and Sub, the latter of which is a tad confusing because it implies something to do with pitch or keyboard position, which it’s not. On the Prologue 16, there’s a dedicated panel that allows you to switch on the Sub, determine how it’s combined with the Main, determine the relative levels of the two, and whether the panel edits one, the other, or both simultaneously. On the Prologue 8 these decisions have to be made in the Program edit menu and, on both models, the split point has to be set in a menu. Of course, the Prologue 16 becomes eight-note polyphonic when layered or crossfaded, and the Prologue 8 becomes four-note polyphonic, which would be all the justification that I needed to pay the extra for the larger model. 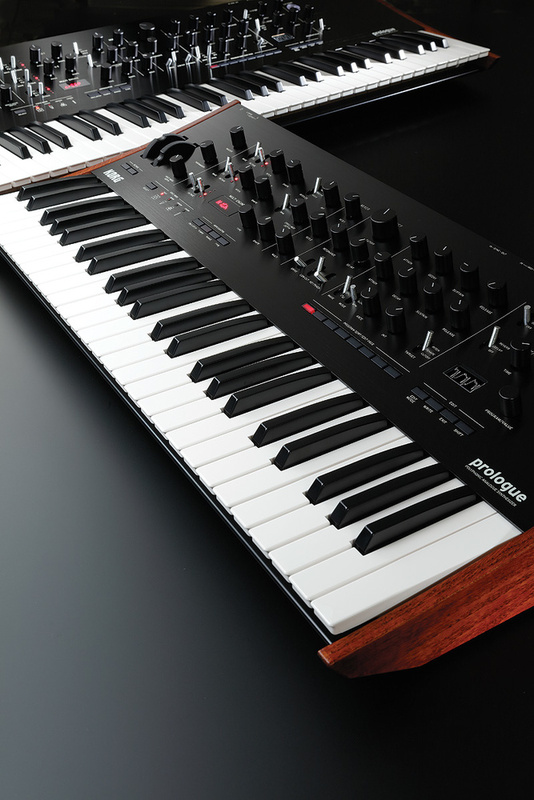 As well as an extra octave to its keyboard, the Prologue 16 also boasts a built-in analogue compressor. Three other capabilities are worthy of mention here. Firstly, you can load a Timbre from one Program into the Sub Timbre of another, whereupon the copy is stored in the new location, so you can edit it without affecting the original, and vice versa. You can’t load a Timbre into the current Main Timbre, which means that you can’t fetch THIS from one Program and THAT from another to create a new Program; instead, you have to save a copy of the Program containing the wanted Main and then fetch the Sub into that. Secondly, you can determine which effect or effects will be applied to which Timbre, with both effects generators offering options for Main, Sub and Both. Thirdly, you can assign different MIDI channels to the two Timbres, meaning that you can sequence them independently over MIDI, or play one and sequence the other. The Prologue has no internal sequencer, and I am happy with that decision. There is, however, an arpeggiator that offers controls for Off/On/Latch, Tempo (30 to 600 bpm with tap tempo, or external analogue or digital clock), Range (one to four octaves) and Type. There are six Types and, although the names are unconventional, these equate to Up, Down, Up/Down, As Played, Random and Poly Random, the last of which plays two random notes selected from whichever keys you press. I very much like this; the results can be magical, capable of providing an evolving soundscape worthy of any film or TV soundtrack. You can direct the arpeggiator to both Timbres, or to just one, allowing you to play the other manually. Next, we come to the Program level parameter, which allows you to adjust the volume of each Program relative to others, the Voice Spread parameter, which distributes the notes you play across the stereo field, the Voice Mode Depth (see box) and an analogue compressor (not on the Prologue 8) that sits after the master volume control and thickens the sound considerably. The compressor’s settings are not saved in Programs so, to achieve optimum results, you may need to adjust it each time you select a new sound. Finally, you can determine the amount of pitch-bend independently for the up and down directions, and you can assign one of 32 parameters to the modulation wheel, and another one from 32 options to the expression pedal, all on a per-Program basis. Mind you, it would be even better if you could assign multiple parameters simultaneously. There’s lots that’s good about the Prologue 16 and, despite its apparent simplicity, I was able to obtain some very classy sounds from it. Starting from the Init program, I immediately stumbled across patches that transported me back to the 1970s. I then moved on to some of my favourite patches — solo brass, string ensembles, and so on — and was impressed by the open and natural character of the sounds that I obtained. I suspect that this is a consequence of the filter, which allows the Prologue to ‘breathe’ more than a 24dB/octave filter would, but without seeming weak or flaccid. Of course, more filter profiles would facilitate a greater breadth of sounds, but the Prologue is what it is. Moving on, I created some fabulous, eerie sounds and then, at the other end of the spectrum, invoked the filter overdrive and the compressor, which worked well to increase the power and the depth. Delving deeper still, I obtained some surprisingly complex sounds, with each Timbre providing two ‘parts’ — one comprising an analogue VCO/VCF/VCA chain (sometimes employing the sync, cross-mode or ring-modulation options), and the other employing the Multi Engine passed directly to the VCA. Then, when I then started to experiment with the voice modes and arpeggiator, things became even more interesting. While doing this, I noticed some inconsistencies in the voicing. For example, when using certain static waveshapes of the Sin 1 (FM) Multi Engine oscillator, playing up and down the keyboard revealed tonal differences between notes. Whether you view this as adding character or something to be avoided is your choice but, when mixed with other elements in complex sounds, it certainly added something to the results. As I continued over a period of a few weeks, I realised that the Prologue has its own, distinctive character, both in terms of how you approach it and the sounds that you get from it. This doesn’t imply that it’s mono-dimensional; while its sound is what we used to call ‘Japanese’ (as opposed to ‘American’) back in the 20th Century, it can be gentle or aggressive, fairy dust or lead boot. But, no matter what I did, I always felt that I was programming and playing a Prologue rather than another polysynth. This isn’t a criticism; far from it. In an era of ‘me too’ synths, from stunning recreations of past glories to blatant copies of other people’s designs, something that feels a bit new and a bit different is to be welcomed. Of course, it’s not perfect, and it will come as no surprise that I’m going to complain about the lack of aftertouch, either played or received over MIDI. I find this omission unfathomable on an instrument that the company has decided to call a flagship because the keybed itself — which is very playable, I might add, and apparently the same as used in the Kronos 61 — is capable of generating aftertouch messages. This means that someone at Korg made a conscious decision not to implement aftertouch in the voicing, which makes no sense to me. In a similar vein, while the rest of the performance features comprise velocity sensitivity, sustain and expression pedals plus pitch-bend and modulation wheels, the wheels are positioned behind the keyboard. This seems more common today than it was in the past, and it saves space, but it’s the wrong place for players brought up on the likes of the Prophet 5, the OB-X, the Memorymoog... and almost everything else, whether the synth in question used wheels, flippers or joysticks. The Prologue also lacks a mechanism to allow you to jump directly to wanted Programs. Sure, you can sort them in various ways to make access simpler, but it’s not the same as typing in 391 and pressing Enter to recall Program 391. Perhaps by way of redress, you can create four Live Sets of up to eight Programs, but bear in mind that this operation doesn’t make copies of the Programs, so any changes in the original will affect every instance. I’m also concerned that the Prologue comes with a quick-start guide but no manual, which has to be downloaded. I know that this is the modern way, and it’s probably acceptable for low-cost products, but it’s not appropriate at the high end. Finally, I need to mention the MIDI specification because, as they did with the Minilogue, Korg’s engineers have chosen to ignore the standard MIDI CC map. Improvements have been made — for example, CC5 is now portamento time, and CC64 is now damper on/off, as they should be — but there are still oddities. Furthermore, while the manual states that “the Prologue lets you assign MIDI control change numbers (CC#) to the major parameters that affect the sound, and control these parameters from an external MIDI sequencer while you play the tone generator. You can also use the front panel knobs or buttons to transmit these control change messages, in order to control an external MIDI device,” I’m afraid that it’s not true. It may become so in the future but, at the time of writing, there’s no way to assign CCs. In 2014, I reviewed the Minilogue and suggested that we keep our fingers crossed for a Pro version. Consequently, I wasn’t surprised when, upon the Prologue’s launch, some people wondered whether it would prove to be an enhanced Minilogue with a few extra voices. It’s not. 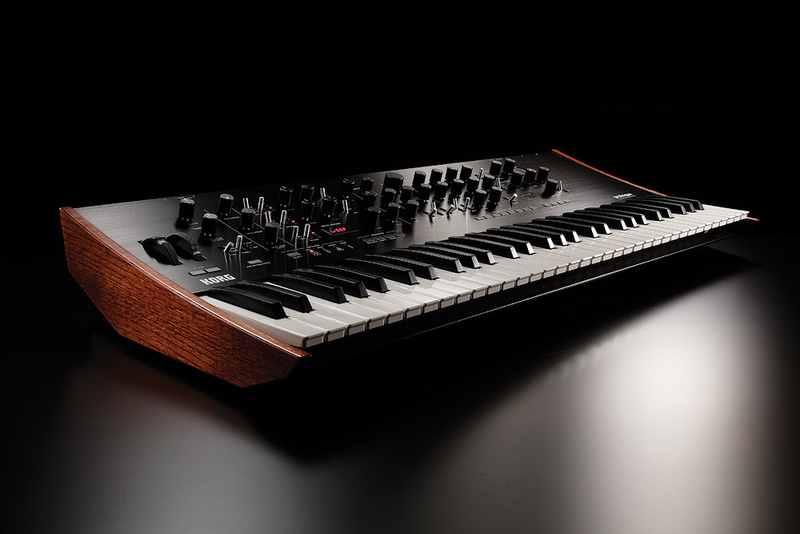 While there’s much that’s similar to the earlier model, there’s much that’s new; and, despite omissions such as the sequencer and some of the voice modes, I think that it’s reasonable to suggest that the Prologue is more than just a Minilogue Pro. After all, a bi-timbral 16-voice polysynth with 32 VCOs and 16 digital oscillators is a beast, and it’s capable of generating some mighty leads, basses and pads, while also being capable of great delicacy, with all manner of tinkling, glassy, fairy-dust patches just a few twiddles away. Ultimately, I wonder whether it was the right decision to keep the Prologue’s architecture so simple because, on a feature-by-feature basis, there are current alternatives that offer far more. But I’m happy that Korg are moving their analogue technology upward from small boxes and baby synths. As consumers, we’ve become obsessed with getting something for nothing (or, to be more precise, getting lots for almost nothing) to the point that some manufacturers have designed increasingly cheaper instruments with reduced performance capabilities in order to carve out a slice of the market. The Prologue isn’t one of these and, with its stylish design, full sized keys, well-designed control panel, solid construction and quality sound, there’s much to like here. I’m delighted to see a modern, ‘pro’ analogue/digital hybrid polysynth coming out of Japan, and I hope that it proves to be the first of many. Unreleased at the time of review, the Prologue SDK is due to appear later in 2018. In principle, this will allow software developers to create new digital oscillators that can be uploaded using the (also unreleased) Prologue Librarian into the 16 slots in the User section of the Multi Engine. Developers will be able to reveal algorithm parameters to the Shape knob and place up to six additional parameters in the Program menus, which suggests a great deal of flexibility. I wouldn’t be surprised if Korg had already created a bunch of such oscillators just in case third-party adoption of the SDK proves to be slow or difficult. The SDK will also allow programmers to develop new modulation effects to fill the 16, as-yet invisible, user slots in the Mod Effects section. Once uploaded, these effects will appear alongside the existing ones. For understandable reasons, the SDK won’t be suitable for players and dabblers, having been developed for people who know their ways around signal processing and DSPs. You’ll find a surprising number of parameters buried in the Prologue’s three menus: Program (things that affect a given Program), Function (housekeeping functions) and Global (things that affect the synthesizer as a whole). With no fewer than 34 voicing parameters in the Program menu, you might think that a lot of the synth isn’t being controlled using the knobs and switches on the control panel and, to an extent, you would be right. However, there are many things here that you’ll probably be happy to set and forget. It’s unlikely, for example, that you would want to grab a knob to change the velocity sensitivity of the VCF or VCA during performance, important though these things are to the sound that you’re creating. Mind you, I would never advocate twisting the filter cutoff frequency knob during a performance either: if you want to affect a voicing parameter while playing, assign a controller to it, don’t use the programming controls! 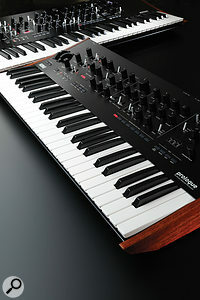 The Prologue is a polysynth, not a workstation, and its rear panel reflects this, with just stereo audio outputs and an associated headphones output, all using quarter-inch sockets. Curiously, it lacks an audio input, which means that it can’t process external audio. Analogue synchronisation of the arpeggiator with external gear is provided by 3.5mm sync in/out connections, while digital communications are handled by MIDI in and out plus a USB B connector that carries MIDI but not audio. Between these lie two control sockets: one for a sustain pedal and the other for an expression pedal that can be directed to numerous voicing parameters. Finally, there’s the welcome return of an IEC mains input and its associated on/off switch for the internal PSU. Both of the review units that I tested were 220-240 V only, which means that there will be different models for other markets. Be careful, or tears may ensue. The Prologue offers four Voice Modes, and a menu item determines whether the single-key modes (Mono, Unison and Chord) are single- or multi-triggering. However, there’s no parameter for key priority, which is permanently ‘last note’ with, in single-key/multi-triggering modes, retriggering of a held note when a later one is released. This is always a boon when attempting rapid solos. Doubles the sound and increases the detuning. Introduces sub-oscillators one and two octaves below the fundamental. Monosynth with all voices played per note. Produces a chord when you play a single key. Selects from a set of predetermined chords. Nowhere is the Prologue’s digital control more obvious than in its use of Shift functions. Given the small number of them, it would have been nice if these had been printed on the control panel... it shouldn’t have been hard to accommodate them. Tune the oscillators in semitones. Alter the FM modulation ratio. Select sub-types for each of the effects. In many ways, it’s a big, heavy analogue polysynth, but without the size or the weight. Its control panel, while not all-encompassing, is clear and stylish. Adding the digital Multi Engine to a largely analogue synth hugely extends its capabilities. The quality of the effects is better than you might expect on a polysynth. The expansion potential of the Multi Engine and the Mod effects is intriguing. The whole sounds and feels greater than the sum of the parts. The voicing architecture is deliberately simple and constrained. The slowest attack times are not slow enough. Its MIDI CC map is non-standard. I don’t like pitch-bend and modulation wheels to be behind the keyboard. In the Prologue, Korg have created a modern and flexible instrument to satisfy players who yearn for the good ol’ days when analogue polysynths ruled the world. And the upcoming software developers’ kit means that its potential for future enhancement is almost unlimited. Prologue 8 £1299, Prologue 16 £1739. Prices include VAT. Prologue 8 $1499, Prologue 16 $1999.